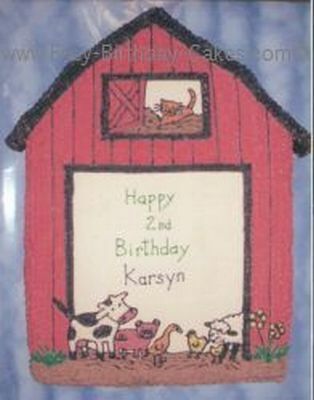 With an icing filled bag and round tip, size #5, draw the barn and the animal figures on the top of the cake. Cut the cake away from the barn shape. Make a cream colored icing and with a cake spatula, put icing on the doorway opening and the loft opening and make it nice and smooth. You will use the round tip, size #5 to do all of the outline work and the star tip, size #16 to do the fill in work. Make a black icing and outline the barn doorway and the loft opening and the roof. Outline the lines in the barn and the loft door and the hay. Finally, outline the flower and all of the animals. All these outlines are done in black icing. Fill in the barn doorway, the loft opening and the roof with black icing. Fill in the barn and the loft door with red icing. Now fill in the animals. The cat is filled in with a light and darke orange icing. The cow is filled in with black and white icing and his nose and udder is pink icing. The pig is filled in with pink icing. The goose has orange feet, bill and the body is orange or white. The chicken and the chick are filled in with yellow and the lamb is filled in with black and white with a pink dot on his cheek. The flowers are filled in with yellow icing. the straw is filled in with a yellowish brown colored icing. Finally, using a leaf tip, size #352 and green icing, make the grass on each side of the barn. Write or pint the message in the open doorway of your barnyard cake.